My first Elizabeth Eulberg completely charmed and captivated me -- which has me wondering how I have managed to not discover her earlier? 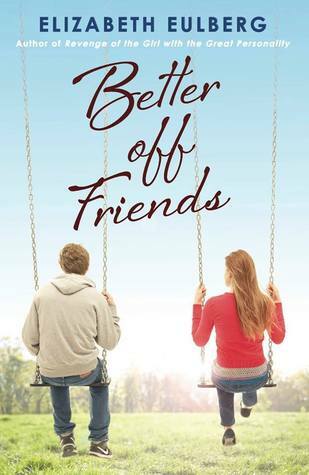 Better Off Friends was completely winsome and breezy with perfectly pitched emotion and depth. It was hard not to fall for these two -- I settled in, snuggled up and just grinned and swooned and sighed my way through this. I think a standout for me is definitely the honesty and realism presented in the pages. It felt true-to-life and without guile. It was fresh without any gimmicky attempt to amp up emotions which allowed the characters and plot to breathe and stand on it's own. I loved the chapters set in Ireland (just an FYI). This is perfect for a rainy day weekend, or a chilled-out beach read. It's been a few weeks since finishing this and it still resonates with me (in a happy-making, smiley way). It is so much what I love about the contemporary YA genre (best friends, crushes, childhood memories, classic coming of age themes, families, self-doubt and identity) all in one addictive, sweet, swoony, achey and fun read. The effortless style drew me in and the characters kept me there. I am whole-heartedly recommending this to all fans of contemporary YA -- especially those of you out there who are in need of a refreshing, charming and effortlessly captivating read (complete with depth and so much contemporary YA goodness). Have you read Elizabeth Eulberg? Any faves from her backlist that I should prioritise getting to? 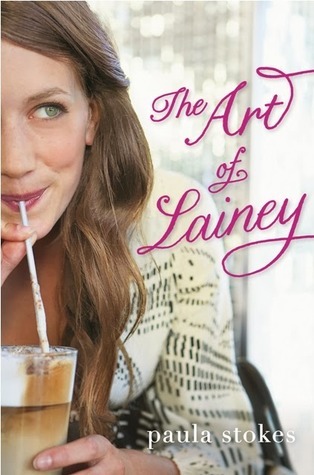 I coveted The Art of Lainey for a while. I was after a contemporary YA with plenty of swoon and fun and easy/predictable drama that did not require much of me but to go along for the ride. Also -- it did not escape my notice that this title was getting consistently favourable reviews from trusted sources. Predictability -- the blurb gives it away a little, you know where it's headed, but you don't know the details along the ride. It's a fun predictability where you will be rooting, swooning and holding your breath for the slow burn pay-off. Also -- some of the popular-style crew were pretty shallow and one dimensional. Are people really like that? Fun -- so many dates and cool scenarios, a cool cafe setting, and breaking free of a whole peer group and discovering something so much cooler instead. Micah -- I already mentioned the swoon. I am mentioning it again because it was my main covetous motivation and this contemp YA brought the goods, and I was one smiley, happy reader. For a girl whose first reading love is contemporary YA, Sarah Ockler is one of my fave authors for consistently delivering my kind of swoony and compelling reads. Straight out I'll admit, if this blurb had not been accompanied by Ockler's name I would have passed #scandal by. 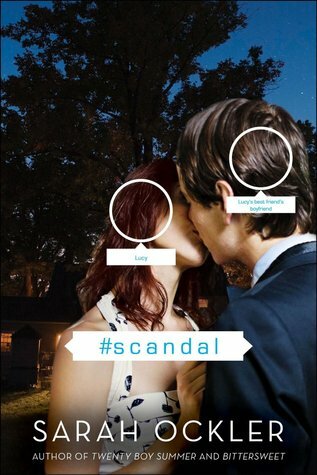 I have limited interest in online scandals, social networking dramas, cyber bulling, etc even while knowing it's an important issue that should be represented in fiction for this generation. But I do have major interest in Sarah Ockler and unrequited love. So cue major excitement because if anyone can get me converted to a tabloid-y internet troll-type story, Ockler would be the one. #scandal opened straight with action at a swirling prom night and after party where characters dance in and out of the scene laying clues and foundations for the inciting event: the forbidden kiss. It's a doozy of an opener, atmospheric and energetic -- Ockler embraces Lacy's voice (wry, authentic and slightly snarky in a nerdy way. Also, endearingly vulnerable and hopeful). It felt like Ockler had a blast writing this -- with witty asides and tabloid newsletters interspersed throughout. It's voice-y and clever and somehow spirited (despite our protagonists quiet misgivings -- there's a spark in the air). The plot follows a truly-awful trajectory of gut-wrenching shaming and a mass trolling fall-out where a small scandal snowballs into your worst nightmare. This is interspersed with Veronica Mars style sleuthing with a budding gang of new-to-Lucy crew trying to work out who is behind the attacks. There's a painful best friend fall-out -- and, sadly, despite the truly awesome prom night kiss -- not much time to explore her relationship with Cole. The pacing is great -- constantly upping the ante with the bullying -- nothing is easy for Lucy. Things go from bad to worse. I felt so, so bad for her. The mystery is sound and the forming of a new rag-tag type group was definitely a highlight for me. However, it was not a me book. I don't like watching teens behaving badly online and witnessing the stomach-churning, relentless despair and overwhelming horror the victims endure. It really is distressing. Also, I missed the Ockler swoon. Cole was cute, sure, and had potential to be serious book-crush contender but he was largely absent for major portions of the book. I also missed seeing their relationship develop from crush, to slow burn to anticipation and realisation due to the book opening with the love already established on both sides. I think if this premise is your kind of thing you should check it out, for sure. I like seeing authors try out new genres and twists on their usual MO but this one just didn't resonate with me like Ockler's previous books. Still -- #scandal grabbed me and I charged through it, butterflies in my tummy and all, within 48 hours. 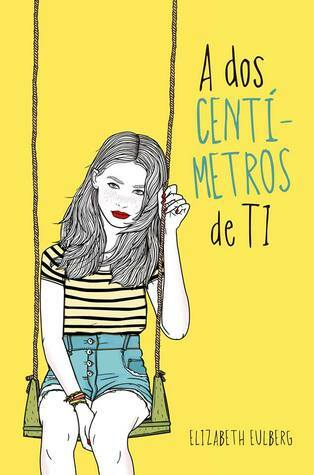 In this dazzling debut novel, a pregnant teen learns the meaning of friendship—from the boy who pretends to be her baby’s father. 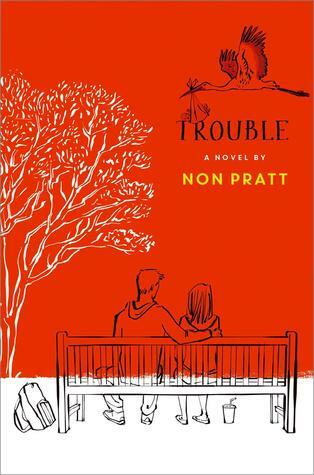 Told in alternating perspectives between Hannah and Aaron, Trouble is the story of two teenagers helping each other to move forward in the wake of tragedy and devastating choices. As you read about their year of loss, regret, and hope, you’ll remember your first, real best friend—and how they were like a first love. 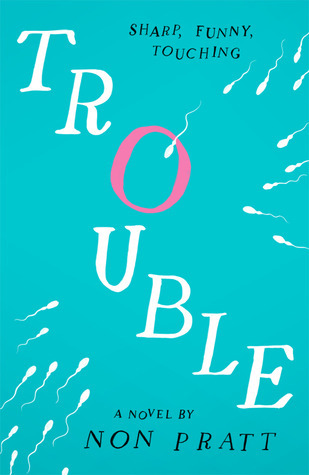 While Trouble is written in an effortlessly engaging style I wasn't sure whether this UK YA would be my thing despite it having 5 star ratings from trusted friends. Look, it opens with a dose of partying, alcohol, random sexytimes, attitude and angst, and some school mean girl undertones. I have definitely outgrown these themes (they have never been my-kind-of-thing in YA) but Hannah's voice was so refreshing that despite everything I continued on. And I'm glad I did. I was hooked on voice from the start -- but, IMO, the first 50-80 pages are the weakest. Things really gained momentum after a tenuous start and it soon became clear that this book is completely non-cliche, full of genuine heart, 3D characters and a plot that sails along unexpectedly (whatever you assume this teen pregnancy book is about, it isn't). I love how Trouble is told in alternating POV -- like the plot, it is unconventional -- happily switching between Hannah and Aaron mid-scene, flipping back and forth in short bursts or sometimes holding one POV for extended lengths of time. Also it would be criminal for me not to mention the swoon (in an unexpected and unpredictable way). I liked this a lot -- it was engaging and a read I found myself heading back to, consuming it in a couple of days. I am impressed with this debut and have a feeling Non Pratt could easily become a fave YA author of mine. A shaky start for me that built in awesomeness to a spectacular ending. So watching out for what Pratt has next. *If we're talking stars: I'd say 3 stars for the first half and 4.5 stars for the second half.